But the storm has taken a wide right turn. 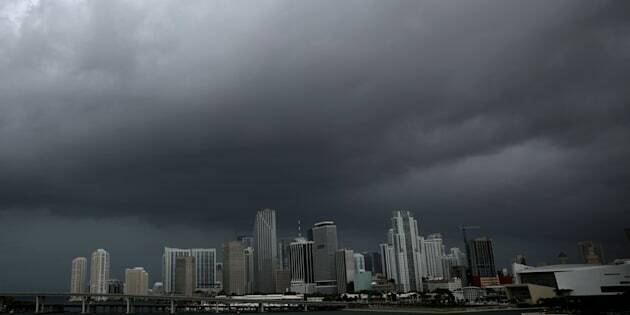 Dark clouds are seen over Miami's skyline prior to the arrival of Hurricane Irma to south Florida on Saturday. NAPLES, Fla. — Hurricane Irma's leading edge whipped palm trees and kicked up the surf as it spun toward Florida with 125 mph winds Saturday on a projected new track that could subject Tampa — not Miami — to the storm's worst fury. The westward swing away from Miami in the overnight forecast caught many people off guard along Florida's Gulf coast and triggered an abrupt shift in storm preparations. A major round of evacuations was ordered in the Tampa area, and shelters there soon began filling up. Still, Miami was not out of danger. Because the storm is 350 to 400 miles wide, the metro area could still get life-threatening hurricane winds and dangerous storm surge of 4 to 6 feet, forecasters warned. The window was closing fast for anyone wanting to escape before the arrival of the fearsome storm Sunday morning. Irma — at one time the most powerful hurricane ever recorded in the open Atlantic — left more than 20 people dead across the Caribbean. But that soon changed. Meteorologists predicted Irma's centre would blow ashore Sunday morning in the perilously low-lying Florida Keys, then hug the state's west coast, plowing into the Tampa Bay area by Monday morning. Departing passengers form a long queue to check in at Orlando International Airport ahead of the arrival of Hurricane Irma making landfall, in Florida on Saturday. Irma was chugging forward as a Category 3, with winds down considerably from their peak of 185 mph (300 kph) earlier in the week. But the hurricane was expected to strengthen again before hitting the Sunshine State. "This is going to sneak up on people," said Jamie Rhome, head of the hurricane centre's storm surge unit. In Key West, 60-year-old Carol Walterson Stroud sought refuge in a senior centre with her husband, granddaughter and dog. The streets were nearly empty, shops were boarded up and the wind started to blow. "They said this one is going to be bigger than Andrew. When they told me that, that's all I needed to hear." In the Orlando area, Walt Disney World, Universal Studios and Sea World all prepared to close Saturday. The Miami, Fort Lauderdale and Orlando airports shut down, and the Tampa airport planned to do the same later in the day. The Sunshine Skyway Bridge spanning Tampa Bay was closed. Hurricane Andrew razed Miami's suburbs in 1992 with winds topping 165 mph (265 kph), damaging or blowing apart over 125,000 homes. The damage in Florida totalled $26 billion, and at least 40 people died. Boat captain Ray Scarborough and his girlfriend left their home in Big Pine Key and fled north to stay with relatives in Orlando. Scarborough was 12 when Andrew hit and remembers lying on the floor in a hall as the storm nearly ripped the roof off his house.